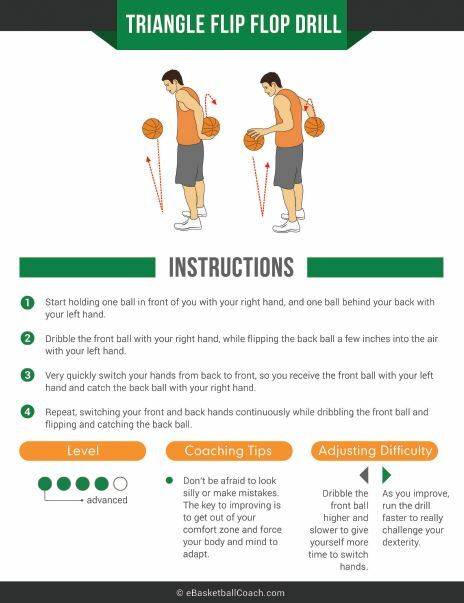 Each drill is featured on a one-page mini-poster, including full-color illustrations, instructions, coaching tips, and ways to adjust the difficulty level up or down. So whether you're playing Bitty Ball, High School, College or trying to get a pro contract, you'll find plenty of challenging drill ideas you can take straight to the court. 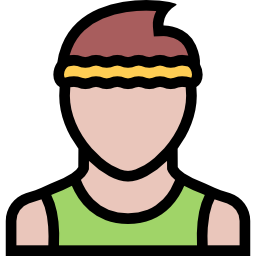 Your Ultimate Ballhandling Workout package also includes 10 pre-designed workout schedules, showing you exactly what drills to run and how long to run them for. The workouts range from beginner, to intermediate to advanced, and run from 5 to 15 minutes long. You can complete these workouts in your basement, backyard, driveway, at the park or at the gym. All you need is a ball (sometimes two balls), and a flat space to work. Just print out your workout (or save it to your phone), and you're good to go! If you prefer to have a hard copy, you can print out the entire ebook. Coaches have our permission to print up to 15 additional copies for their team’s personal use. 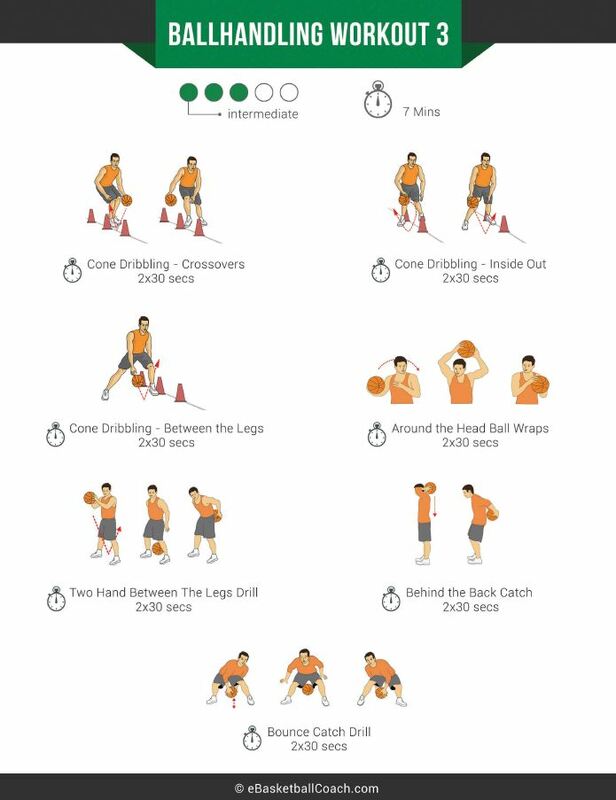 These Print n’ Go workouts will rapidly improve your skills, take your game to the next level, and help you achieve your basketball dreams. Every drill can be run using individuals, small groups or even full teams. 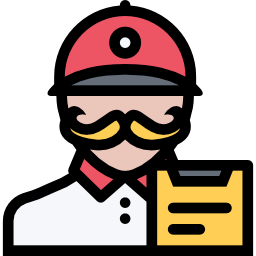 Put together a killer “stations based” practice in just a few minutes. No stress. No fuss. Help your son or daughter get a leg up on the competition with these time-tested drills. Perfect for in-season skill development or off-season workouts. We’re so confident in these workouts that we’re going to put our money (and reputation) on the line. Use these workouts 3x per week for the next 4 weeks. If your ballhandling skills don’t improve by leaps and bounds, just write back and we’ll give you a full, fast, and cheerful refund. 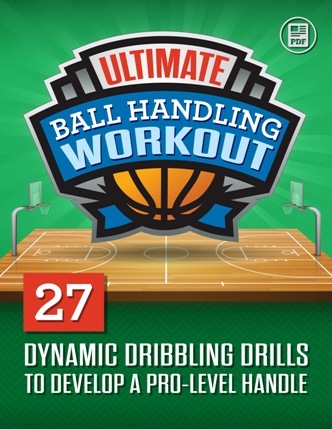 Hurry... Get Ultimate Ballhandling Workout Now! ... all for just $49.95 $29.95 $9.95. Click the Add to Cart button now for INSTANT ACCESS! What age is this designed for? These workouts are designed for players of all ages and competitive levels, from youth to college. Each drill includes instructions to increase or decrease difficulty, so they can be easily customized for all ability levels. You’ll start seeing improvements within 1 week. But don’t stop there! Continue using the workouts for 4 weeks, and if your ballhandling skills haven’t improved by leaps and bounds, just email us and you’ll get every penny back. No questions asked. All the drills can be done by a single player or with a group, so they’re perfect for individual skill development or full team workouts. 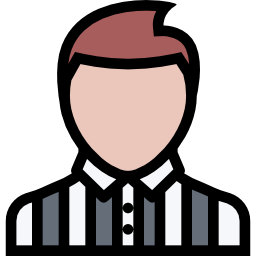 Since 2006, we've helped more than a quarter of a million coaches and players with our online training tools and programs. Join us now and become our next success story!